It starts with your phone call. We answer our phones 24/7, and we will carefully listen to your wildlife problem. Every case is different, so we will ask appropriate questions to help us understand the situation better. Questions like, "do you hear the noises at night or during the daytime?" or "what type of roof do you have?" After we have a general idea of your situation, we can provide a ballpark price range, and schedule a same-day or next-day appointment to inspect your property. All ground-level areas, such as piper or A/C line entry & exit areas, A/C chase bottoms, ground-level vents, etc. All mid-level areas, such as dryer vents, siding gaps, first floor eaves or dormers, etc. 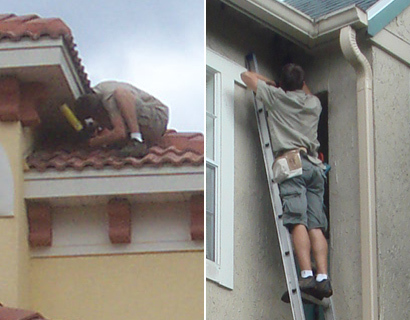 We inspect the entire roof, including all plumbing stacks, ridge caps, vents, and other potential gaps or holes. 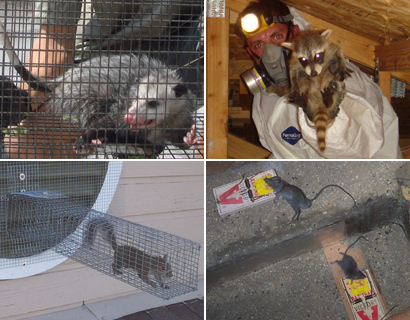 We also inspect inside your attic, to identify animals and damage they have caused. If the animals are outside, we notice many subtle clues that will assist us in a successful strategy. TRAPPING, EXCLUSION, REMOVAL: Once we understand what animal species we are dealing with, and the problem, we use the most effective means of removing the animals. We use dozens of different types of traps. Trapping - If trapping the animal(s) in live cage traps, trap type, set, and location are crucial to success. Exclusion - Oftentimes, we are able to simply set one-way doors or other exclusion devices that allow the animals inside a building to safely exit, but never get back inside. Removal By Hand - Sometimes we actually remove animals by hand, or with special tools like snare poles. The Law - In all cases, we obey state and local laws regarding wildlife, but aim to take the most humane approach. 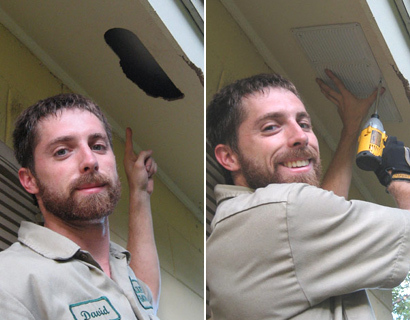 ENTRY HOLE REPAIRS: Repairs are a crucial step in the wildlife removal process. In many cases, such as bat or rodent control, the job cannot be performed without detailed repairs, and in all cases, sealing the entry holes shut ensures that no future wildlife will ever enter your home. 100% of the entry holes must be found, and sealed shut, or the job is not complete. Our repairs are professional contractor grade, look good, and when applicable we use steel, which rodents such as rats or squirrels are unable to chew through. We give a written guarantee on our repairs against any future animal entry. 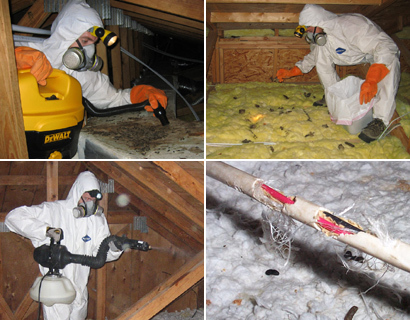 ATTIC DECONTAMINATION SERVICES: It may be desirable to clean your attic after we've removed the animals. They can leave behind large amounts of droppings, urine, hair, oils, food, nesting material, and so on. These remnants can attract insects like cockroaches, and the scent left behind can encourage new animals to chew their way into your house. You might experience odor problems from the waste. It's possible that mold will grow on waste areas. We remove or vacuum all droppings, or remove all the soiled insulation. We fog the attic with a special enzyme-based cleaner that destroys any organic matter and deodorizes the space. We repair damage, such as ductwork, electrical wires, pipes, insulation, and more. The above are just a brief explanation of some of our methods. I haven't even addressed the hundreds of other potential cases that we deal with, from bat exclusions, to poison-free rodent control, to dead animal removal, bird roosting prevention, mole trapping in a yard, ground-based exclusion barriers around a shed, etc. etc. Just give us a call any time, and we can describe in detail how we will resolve your specific wildlife problem. We service Middlesex County, Ocean County, Mercer County, Burlington County, Richmond County, and more. We also service Asbury Park, Aberdeen Township, Long Branch, Colts Neck Township, Allenwood, Freehold Township, Belford, Hazlet Township, Holmdel Township, Howell Township, Manalapan Township, Cliffwood Beach, Malboro Township, East Freehold, Middletown Township, Millstone Township, Neptune Township, Ocean Township, Fairview, Leonardo, Lincroft, Morganville, Navesink, North Middletown, Oakhurst, Shrewsbury Township, Ocean Grove, Port Monmouth, Upper Freehold Township, Wall Township, Ramtown, Robertsville, Shark River Hills, Strathmore, Wanamassa, West Belmar, West Freehold, Yorketown. and more. To learn more about our services, visit the Monmouth County wildlife control home page. Snakes are very harmful to human beings especially in instances where they feel threatened by human activities. As well known by most, snakes are capable of biting human beings and any pets that may be roaming about one’s premises. For the venomous snakes, their bites may result to very serious health complications and may at the end cause deaths. It is hence very important to ensure that snakes do not sneak into your garden for any reason. Prevention is better than cure and hence it is very essential to prevent snakes from accessing areas near one’s premises. •	Existence of scaly skin sheds in one’s yard is is a clear sign that there might be some snakes roaming about. •	Clear all low growing plants – snakes are fond of using particular shrubs such as grass as their hiding areas. It is very hard to notice snakes under such shrubs. For this reason, it is essential to keep such shrubs mowed at all times and this will discourage snakes from coming to such areas. •	One of the reasons why snakes come to gardens is the need for food. Existence of pests such as mice living within one’s garden area would be an encouraging factor for snake invasion. It is advised that one should first get rid of such pest and all other food sources for snakes in order to rob them the reason for visiting your garden. •	Any holes that may exist around fences to the garden should be patched up completely. Snakes are fond of using very tiny openings that they find around fences to access human premises. It is important to note that snakes, whether venomous or not are of no good around human beings. They are wild animals and for this reason should be kept away at all times to avoid harming people or other domestic animals living there.